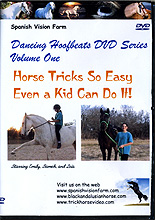 Before you start the more difficult tricks, this is a great DVD to show you some simple tricks that any level or age of rider can teach their own horse! No special equipment is needed to have fun with your horse and create your own performance to share with friends and family. This video about training trick horses shows an Arabian and Andalusian horse and has a bonus mare/foal video. Great for horse lovers of all ages, mothers, daughters, fathers, and sons - anyone who loves horses and kids. Whether you're training an Arabian, quarter horse, Thoroughbred, Morgan, Andalusian, Peruvian Paso, Miniature Horse, paint, appaloosa, gaited horse, or draft horse, you'll find something interesting! Ride English, western? reining or dressage? Do endurance? Doesn't matter, basic horsemanship is basic horsemanship. This video shows good techniques, natural horsemanship, safety (helmet use), and real training sessions with lessons and coaching from a professional horse trainer. - Tricks can be taught by anyone to any breed of horse. - Includes instruction on 10 tricks - how to teach your horse to say no, how to teach your horse to say yes, counting, the Spanish walk, giving a kiss, giving a hug, hide your head, give a "gentle" shove (the drunkard's shove), hold a flag, and wave a flag. Donna DeYoung has been raising and training Andalusian horses in Texas, USA, since 1996. She has been around horses her entire lifetime and has ridden, shown, trained, and competed on many different breeds. Her passion is raising high quality Pure Spanish Horses (Pura Raza Espanola) in the Spanish tradition. She also owns a Peruvian Paso and competes in Endurance riding on her Arabian gelding. Donna has been filming movies and videos since she was a teenager and is a gifted artist. She has Bachelor's Degree in Education and a Master's Degree in Environmental Science.